Like cards with massive pieces of memorabilia? 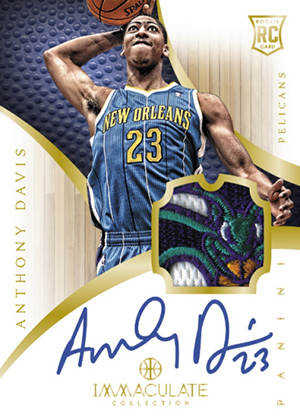 2012-13 Panini Immaculate Collection Basketball marks the debut of a new brand that emphasizes swatches of a larger, more unique variety than are found in other products. Panini likens it to a hoops version of Prime Hockey. 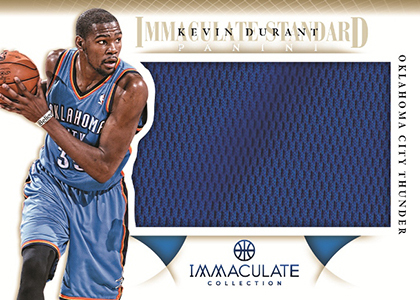 2012-13 Panini Immaculate Collection Basketball has four hits in every single-pack box. While that configuration is nothing new, don't expect to find very many run-of-the-mill memorabilia cards with plain white nickel-sized swatches. Autograph Patch Rookie Cards are numbered to 99 or less. Every box has at least one other autograph. Among these are All-Star Lineage and Title Winners. These focus exclusively on players who have appeared in the NBA All-Star Game or won a World Championship. Depending on the set, each is numbered to either their All-Star appearance or championship rings. Boxes also have a minimum of one unsigned memorabilia card. Immaculate Insignias and Immaculate Logos both use over-sized patch pieces from prime jersey spots. Most of these should be instantly recognizable. Immaculate Numbers come numbered to the player's jersey number. Immaculate Standard combines jumbo swatches with acetate stock. Immaculate Caps use pieces of player-worn hats. Six Star Logos is a series of one-of-one book cards. Each has six Logoman patches. The high-end product does have base cards. Falling one per pack, they come numbered to 99. 82 cards. Click here for a detailed visual guide. 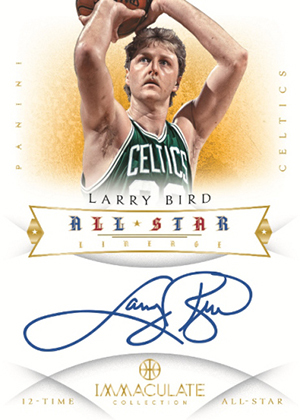 Serial Numbered to number of NBA All-Star appearances. Serial numbered to the player's jersey number. Serial numbered to number of NBA Title wins. The logos and insignias I’ve seen from this are pretty amazing..I think people are going to pay big money to try and complete some of the top teams . I’ve been looking for a checklist for a few days and this is the best I’ve found. I find it kind of crazy as popular as box breaking has become, and when they put out out the teams so far in advance of release day, that you can never find a checklist but yet they have the values already set for each team despite no checklist being out yet. Ok so there’s a sell sheet but that really doesn’t give much. I hope in the future companies start releasing checklists sooner. It really is no secret as to who is going to be in most of the sets anyway so get these checklists at least out by release day as sometimes that isn’t even happening. This is big business but companies are as usual, slow to capitalize like they could be. Scott � Sometimes things are better than others. Doesn’t seem to be a lot of rhyme or reason. 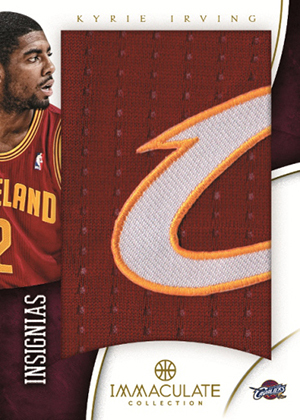 The 13-14 Prestige checklist was available more than a week early. Flawless wasn’t until after it was out. Same with Immaculate now. We’ll have it posted as quickly as possible. Agreed, I’m making the crazy attempt at the 100 card /99 base set, just snagged my LeBron. I am at 31/100, and I need a base checklist bad. Cracked a box, and got a sick Lillard patch, Ross hat button, nice triple patch /25. Definitely a cool product, my Lillard has a very impressive patch, and is already on its way to BGS. Can’t wait to see the checklist, and try for the full 100. Ian Campbell � The full checklist is on this post. Click the Set Checklist tab at the top and it should be there.